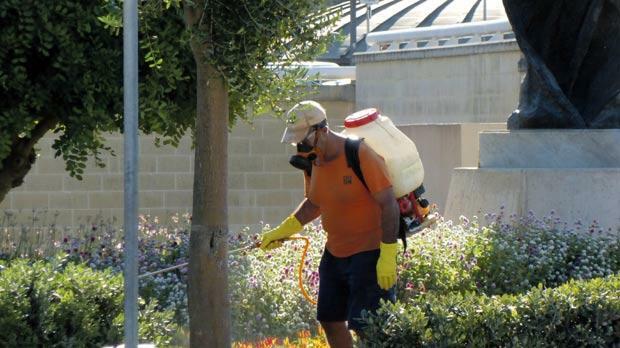 Following the article in the Times of Malta, which was also posted on this blog, the Minsiter for the Environemnt, made a statement on Glyphosate during the parliamentary sitting of 16th January, 2017. I am posting a photo shot of such comments, downloaded from the Minister’s Facebook page, and kindly forwarded to me by the Clean Food Movement. A clear, official indication that the commercial rules of the free market come before any concerns for human health, the safeguarding of the ecosystem, and additional public expenditure to correct the negative impacts. All in the name of commerce! This despite the official EU claims that the EU does not authorise the placing on the market of pesticides, because this is the responsibility of the Member States, as explained in the previous post on this blog. I still cannot find any reference where the EU concluded that glyphosate is not cancerogenic. Previous findings from the World Health Organisation’s International Agency for Research on Cancer, concluded that glyphosate is a ‘probable carcinogen’. A study was conducted over two years at Kings College, London. It found that residues of popular weedkiller glyphosate found in food can cause fatty liver disease. Rats were administered a very low daily dose of four nanograms per kilogram of bodyweight per day. To put that into perspective this is 75,000 times below the levels of glyphosate permitted in the EU in our food. According to lead researcher Dr Michael Antoniou, previous studies on human urine found that we often consume around a thousand times the amount of glyphosate the rats consumed. Regulators globally accept toxicity studies in rats as indicators of human health risk, making this a signiÏcant, a truly disturbing, discovery. Glyphosate has only now been recognised as a cause of the liver disease (nonalcoholic fatts liver disease), which can cause fatigue, weakness, weight loss, loss of appetite, nausea, abdominal pain, spiderlike blood vessels, yellowing of the skin and eyes (jaundice), itching, and swelling of the legs and abdomen, and mental confusion. I do honestly hope that no politician can dare say that there is nothing wrong with this as long as it is not cancer. Unfortunately, I can only join the bees and say: “Thank you Honourable Minister” for the heroic efforts towards human health and the environment. Future generations will be grateful for the ‘price’ they will have to pay. Malta can still decide to ban products containing the weedkiller glyphosate and does not need any EU permission, environmentalist Alfred Baldacchino insists. Mr Baldacchino, a former assistant director of the environment directorate at the Malta Environment and Planning Authority, was contacted after this newspaper was informed the government would only ban the use of glyphosate when such a move was ordered by the EU. Only last summer, the Environment Ministry said the government had started the process to ban glyphosate. However, only products containing both the active substance glyphosate and the co-formulant POE-tallowamine are being banned. This, according to the ministry, includes Hopper Blu, Roundup, Roundup Max and Seccherba Respect. The price society pays to have ‘cheap’ food. Is it worth it? A study has just been released showing that Roundup caused liver disease in rats. The World Health Organisation’s cancer agency says glyphosate itself is a “probable carcinogen”. Mr Baldacchino said the government was right to vote last June against the use of glyphosate in line with the precautionary principle cited by environmental groups, which stated that potentially hazardous substances should not be used unless they were proven to be safe. “Malta can still decide to ban products containing glyphosate if it is not sure that the chemicals can have negative health and ecological impacts,” he insisted. Mr Baldacchino noted that it had already been proven that glyphosate killed bees, directly when they came in contact with the product and also by killing the flowers they fed on. Traces of the chemical had also been found in honey. “What more proof does the minister need? The minister should seek the advice of all stakeholders, not just commercial ones, and this includes NGOs, technical experts, health experts, environmentalists and beekeepers,” he said. The ministry, Mr Baldacchino continued, should also make clear what its intentions were and how it would enforce the ban. He wondered who would monitor what chemicals were used in herbicides and pesticides. In a letter sent to the Environment Minister, the Clean Food Movement expressed dismay at the ministry’s watered-down position, saying the ban had turned out to be “no more than window dressing”. “We are now more concerned than ever about the possible continued use of glyphosate on these islands,” the letter to the minister read. Contacted in his capacity as chemical expert, Alfred Vella, the University rector, said herbicides containing more than one active ingredient did exist. POE-tallowamine was frequently present in herbicide compositions to serve as a “surfactant”, which was not designed to kill weeds but to make the delivery of the actual toxic chemical, such as glyphosate, more effective in its action. Still, at high enough concentration, POE tallowamine itself did have toxic properties in the case of certain organisms, he said. Concern usually revolved around the stability and durability of herbicides and pesticides after being dispersed in the environment. If their stability was high and they remained on edible produce for far too long, it meant they could be consumed together with the vegetables containing them. There were also concerns about their solubility in water, as rainwater would be able to take chemicals down to the water table or nearby seawater. On the other hand, chemicals that were not easily soluble in water were normally quite soluble in fatty matter, meaning they could be absorbed through the skin if contaminated harvested produce came in contact with animals or people. The price the ecosystem pays to have ‘cheap food. Is it worth it? Prof. Vella acknowledged there was concern about pesticides and herbicides in general, however, he advised on looking at both sides of the coin. The use of pesticides allowed agriculture to produce food in much larger volumes and cheaper prices than without the chemicals. While it was possible to live in a pesticide-free environment, society would likely have to pay a price. Apart from increased cost of foods, the decline in production could cut off some people’s access to meat, fruit and vegetables and that would also have health consequences, Prof. Vella pointed out. Does the EU authorise the placing on the market of pesticides? who is paying for this if we may ask? No, that’s the role of member states but active substances in the pesticides have to be approved at EU level. Once an active substance is approved at EU level, the safety evaluation of every pesticide formulation is done at a later stage by individual member states before they grant, refuse or restrict the use of pesticides formulations at national level. In their authorisation decision, member states can therefore define the conditions for use of the product, for instance, restricted to certain crops, for professional use or for use in glass houses only. *Information taken from the European Commission site. The EU met on 8th March 2016 to decide whether to extend for another 15 years, the use of glyphosate, a crucial weedkiller ingredient. The decision was abruptly postponed at the eleventh hour. Glyphosate is a non-selective herbicide that is widely used in agriculture, public areas and private gardens. It is also used in genetically modified crops, which are specifically engineered to resist glyphosate-based products. The International Agency for Research on Cancer (IARC), part of the World Health Organisation, announced that glyphosate was “probably carcinogenic to humans”. Environmental groups have since been calling for its ban. Following WHO’s warnings, the European Chemicals Agency (ECHA) will undertake further studies to see if glyphosate can cause cancer, interfere with reproduction or damage the hormone system. The herbicide glyphosate can enter the body through food or drinking water. A new study has shown that the majority of Germans have been contaminated by the compound. Dead pollinators – bees – after spraying pesticides, especially for purely commercial purposes. According to scientists, heavy and repeated uses of glypohosate-based herbicides, contributes to many envirionmental and soil-ecosystem problems. Glyphosate results in the greatest public and worker exposure, either directly or through residues in food. And its impacts on biodiversity is also well known: it decimates and eliminates pollinators such as bees. On the other hand, the European Food Safety Authority (EFSA) contends that glyphosate was unlikely to cause cancer in humans and proposed higher limits on the amount of residue of the weed killer deemed safe for humans to consume, a report which Greenpeace has referred to as “a whitewash”. Whose responsibility is it: Ministry of Landscaping? Ministry of Health? Ministry of Environment? Ministry of Consumer Affairs?Ministry for Local Councils? Before the scheduled vote of 8 March, leaders from Italy joined Sweden, France, and the Netherlands against the widely-used herbicide. Following such postponement, EU Member States were given till the 18 March 2016 to provide their opinion for the next meeting, scheduled for 18 May. But the Times of Malta (March 29) quoted a spokeswoman for the Ministry for Environment, that Malta did not submit such opinion by the 18 March, because discussions were still ongoing. Workers are just a cog in the pro-business machine. As long as they deliver, it is not important to ensure that they wear hazardous clothing. Following a number of articles and comments in the press, it is now more than obvious that in Malta the eagerness for monitoring and enforcing is at its lowest ebb, if at all. The professionalism of passing the buck is more pronounced. As per Pesticides Control Act, 2001 and the Malta Competition and Consumer Affairs Authority Act, 2011, the competent authority for the authorisation and regulation of pesticides in Malta is the Malta Competition and Consumer Affairs Authority (MCCAA). But, according to this newspaper, MCCAA refused to state it’s position and directed questions to the Environment Ministry. The latter is responsible for the protection of biodiversity, the Pesticides Control Board (PCB) which is chaired by a Ministry’s representative, and also for agriculture for which a parliamentary secretary is accountable. Because of the impacts of pesticides on human food and animal feeds, representatives of the Food and Safety Commission and the Environment Health Department, both under the responsibility of the Minister for Energy and Health are represented on the PCB. One of the functions of the Food and Safety Commission is to effectively apply the precautionary principle when a significant risk to consumers is identified or reasonably suspected. Sitting on the fence is the Minister of Landscaping who is responsible for use of pesticides by his landscaping official public partner who seems to be immune to any regulation with regards to human safety and biodiversity. One would tend to ask. “What would Malta have voted if the matter was not postponed?” In such a sensitive social and ecological matter, one would have thought that the decision was easy. But in all probabilities the pro-business vision is quite a high and a strong hurdle to overcome. From past and present experience, considering the pro-business vision dominating every other sector, and the fortunate position in the EU’s alphabetical list, I tend to start believing that Malta will not go to the next meeting on 18 May with an official public position. The position will be reached according to the way the majority of the EU Member States vote: in other words, where the wind blows. Commercial interests spray to their heart’s content: in public area, in public gardens, in street, outsides residential areas, close to public outlets. Anywhere as long as they make some profit out of it. Externalities will be paid by the general public and the environment. This despite the negative impacts that such a decision will undoubtedly have on society and ecology, which will be more acute locally considering the smallness of the country. Why does Malta have to be feel embarrassed by a vote in favour of society and the environment? One has to wait till the vote on 18 May to see what stand Malta will take: whether MCCAA will be on the side of commercial interests, or use the precautionary principle in the interests of social and environmental health. In 2013, nine of 10 people tested in Malta had traces of glyphosate in their urine, which was the highest rate in Europe. Malta’s position on the use of the potentially cancer-causing chemical glyphosate in pesticides is still unclear ahead of a crucial vote in May, as the European Commission seeks to extend its approval for the next 15 years. Labour MEP Miriam Dalli, however, has voted for a ban on the chemical in the European Parliament, despite the Maltese government so far refusing to state its position. The government was requested to give the European Commission its suggestions on the proposal by last Friday, but an Environment Ministry spokeswoman told the Times of Malta that it had not done so, as discussions were still ongoing. Glyphosate, a common ingredient in weed killers, is considered to be a “probable human carcinogen” by the World Health Organisation, and environmental NGOs have long called for its use to be suspended. Tests carried out by Friends of the Earth Malta in 2013 found that nine of 10 people tested in Malta had traces of glyphosate in their urine, the highest rate in Europe. The Commission’s European Food Safety Agency (EFSA), however, published a report in November stating that the chemical was “unlikely” to cause cancer, paving the way for re-approval. The report was heavily contested by France, Sweden and the Netherlands, who have all come out strongly against glyphosate use. National pesticide regulators from all EU countries, as well as the Commission, met on March 8 to decide on the matter but could not reach the majority necessary for a decision, prompting a postponement of the vote. The Commission proposal includes the authorisation of glyphosate for nearly the maximum period possible (15 years) but also increases the acceptable amounts of glyphosate residues in food by 66 per cent. When contacted, the Malta Competition and Consumer Affairs Authority (MCCAA), the local regulator, refused to state its position and instead directed questions to the Environment Ministry. Informed sources, however, said the regulator had recommended that the government vote to ban glyphosate, although the final decision rests with the government. A resolution passed on Monday by the European Parliament’s Environment Committee, of which Dr Dalli is a member, called for the blocking of the Commission’s proposal. The resolution will now be put before a plenary session in April. Dr Dalli, who voted for a ban, said the EFSA report was based on unpublished studies which should be disclosed before any decision was made to ensure its conclusions were scientifically sound. “Ultimately here we are speaking about the health of our citizens and this is another case where I stand firm in my belief that public health is not negotiable and must not be compromised by any commercial interest,” she said. Former environment directorate head Alfred Baldacchino told this newspaper the EU should apply the precautionary principle enshrined in its treaties, which states that potentially hazardous products should not be used unless they can be proven to be safe. You are currently browsing the archives for the World Health Organisation category.